Last year, Electronic Arts introduced players to a world of mercenaries, co-operative gameplay and gold plated automatic weapons. Army of Two took players on a globetrotting adventure where you needed to use co-op strategy with your partner to survive various hotspots. As Salem and Rios, two ex-Army Rangers turned mercenaries, you battle through different warzones to uncover a conspiracy that could threaten America and the world. But there's no rest for these two soldiers, as today Electronic Arts announced the sequel to the co-op action game. 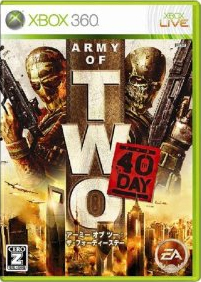 Army of Two: The 40th Day reunites Salem and Rios as they're forced to survive in a city under siege. "With Army of Two: The 40th Day, we're pushing the tactical two-man military team into new battlegrounds offering a completely organic and rich co-op experience to deliver an action-packed co-op shooter this winter," said Reid Schneider, executive producer at EA Montreal. "As chaos blankets Shanghai, China, you must rely on your partner to survive as you weave through a broken city left devastated in a mysterious wake." Army of Two: The 40th day will include more co-op moves for players to use at any time, which will allow for completely different strategies and options in battle. According to EA, the expansion of co-op moves will create a bigger, more organic and immersive co-op experience. 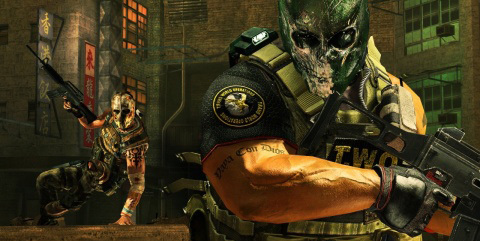 Army of Two: The 40th day will be available for the PS3, Xbox 360 and PSP this winter.